(Nanowerk Spotlight) Turmeric has been an integral part of India's cultural and culinary heritage for thousands of years. Historical evidence says that turmeric was first cultivated in Harappa as early as about 3000 B.C.1, and for the first time, its medicinal potential was recognized and documented in Sushruta Samhita dating back to 250 B.C2. It has been highly valued and revered by Eastern medicinal systems, including Ayurveda and Traditional Chinese Medicine (TCM) for its amazing healing properties for cuts, wounds, ulcers, skin diseases, inflammations, etc. Curcumin is the star bioactive component responsible for turmeric's antioxidant, anti-inflammatory and anticancer properties. Recently, it has emerged as one of the most potent chemo-preventive and chemotherapeutic agents (also see: "Nanotechnology-enhanced curcumin: Symbiosis of ancient wisdom of the East with modern medical science"). Curcumin was first isolated in 1815 by Vogel & Pelletier3 and its structure was determined by Milobedzka et al.4 (for further details on curcumin's chemistry, structure and other characteristics the interested readers may like to see Ref. 5). As can be seen in the figure below, there is a steep rise in the number of research publications and patents starting from the year 2000 onwards. Figure 1: The year wise trend in growth of patents and scientific publications on curcumin. A literature survey was conducted on nano-enabled curcumin, based on published scientific and technical literature pertaining to medicine and healthcare for the period ranging from 2000 to 2010 using the Web of Science database6. A Taxonomic Analysis was performed using the search string: TS = (Nano* and Curcum*) and the subject area was restricted to medicine and healthcare. In addition to the literature survey, patent analysis was also carried out on nano-enabled curcumin using Thomson Innovation database7. The patent survey was carried out using different search strings with key word sets: ALL=((((nano* same *curcum*) or (nano* same diferuloylmethane*)) and ((*inflammat*) or (*cancer*) or (*HIV*) or (*carcinogen*) or (*viral*) or (hepatoprotective) or (angiogenesis) or (*tumor*) or (*gastro*) or (*oxidant*) or (Zingiberaceous) or (turmeric*) or (chemo*)))) AND DP>=(20000101) and DP<=(20101231); for the period 2000 to 2010. There is an upward trend in patenting and publishing activities, which is especially noteworthy from 2007 onwards. One intriguing fact is that the patenting activity is showing a dominating trend in comparison with the scientific research activity suggesting the growing commercial importance of nano-enabled curcumin. It is interesting to note that the first patent on nano-based curcumin was filed8 on November 7, 2000 (Priority date November 26, 1999) and the first research paper on nano-based curcumin for medicinal applications was published in the year 20059. As indicated in our previous article ("Nanotechnology-enhanced curcumin: Symbiosis of ancient wisdom of the East with modern medical science"), curcumin's unique ability to modulate multiple molecular targets makes it a good therapeutic drug for various chronic diseases, including cancer, cardiovascular disorders, rheumatoid arthritis, gastrointestinal disorders, neurological disorders etc. 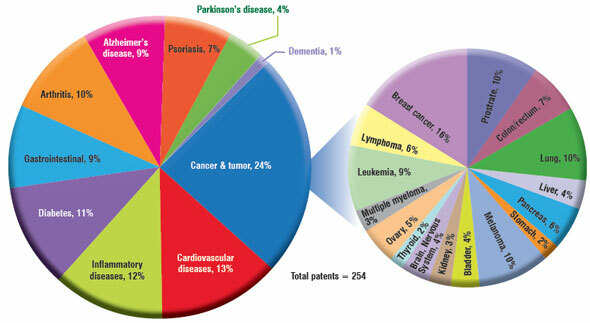 In order to assess nano-based curcumin's potential applications in the field of medicine 254 relevant patents were analysed with segmentation based on the types of various diseases and the data was plotted in the form of a pie chart (see figure below), which shows disease- wise distribution of patents. It is quite evident from this figure that the largest share of published patents (24%) is focussed on cancer therapy, which reflects the importance of this area. The patents pertaining to the treatment of cardiovascular diseases occupy second position with a share of 13%. Apart from this, substantial patenting activity is directed towards the treatment of other major diseases, including inflammatory diseases, diabetes, arthritis, Alzheimer's disease etc. Further, sub-classification corresponding to cancer shows nano-based curcumin's potential for the treatment of breast cancer (16%) followed by melanoma (10%), prostate (10%), lung (10%), leukaemia (9%), and colon cancers. As we have seen in our previous article, curcumin shows great promise as a 'miracle drug' of the future due to its impressive array of beneficial bioactivities. However, its therapeutic potential has not been fully exploited because of its poor bioavailability in animals and humans. Therefore, a number of nano-based approaches are being developed to improve curcumin's bioavailability and reduce perceived toxicity. These approaches include solid-lipid nanoparticles, nanosuspension, nanoemulsion, cyclodextrin curcumin self assembly, hydrogel nanoparticles, curcumin-phospholipid complex and curcumin incorporated within polymer nanoparticles. The figure below shows these various nano-based approaches for drug delivery of curcumin in the form of a pie chart and this survey is based on 124 relevant patents for the period from 2001 to 2010. 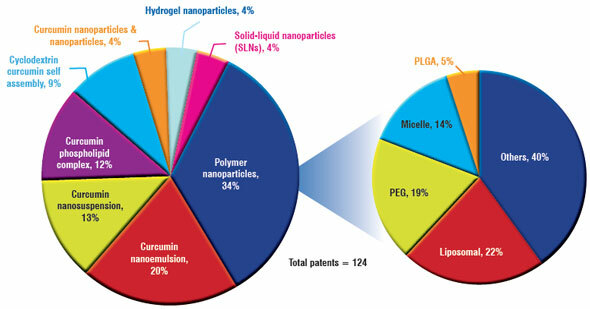 As depicted in this pie chart polymer nanoparticles play a dominant role (34%) followed by curcumin nanoemulsion (20%), nanosuspension (13%), phospholipids complex (12%), cyclodextrin curcumin self-assembly, hydrogel NPs and SLNs in decreasing order. The polymer nanoparticles-incorporated drug delivery systems are further subdivided into various classes of polymers such as generic polymers, liposomal, PEG, micelle, PLGA, and as can be seen, generic polymers, liposomal, PEG and micelle play a dominant role in decreasing order. Figure 3: Various nanotechnology approaches for drug delivery of curcumin. Fig. 4 below highlights the top 10 assignees of patents published/granted in the area of nano-based curcumin along with their focus area of nanomaterials. The analysis reveals that Laila Pharmaceuticals Private Ltd., Chennai, India is the world leader with 8 patent applications to their credit and their main focus is on nanoemulsification of curcumin and its derivatives. Second in the ranking are Johns Hopkins University, USA, and University of North Texas, USA with 7 patent applications each to their credit and their inventions are directed towards use of polymer nanoparticle encapsulated curcumin and curcumin loaded with PLGA-nanoparticles, respectively. The analysis has also revealed that R&D institutes, universities and only a few small bio and pharma companies such as Laila Pharmaceuticals, Magforce Nanotechnologies, Bioderm Research, Nano Cutting Edge Technologies etc. are involved in the patenting activity. Effort has also been made to identify key players actively pursuing research in the area of nano-enabled curcumin. The University of Texas, MD Anderson Cancer Center (colloquially MD Anderson Cancer Center), Houston, USA has emerged as the top publishing institute with 7 publications followed by other major organisations, including Bhabha Atomic Research Centre, Mumbai, India, Shandong University, Shandong, China, Bharti Vidyapeeth University, Pune, India, Rutgers State University, New Jersey, USA, Indian Institute of Technology, Guwahati, India, Johns Hopkins University, Baltimore, USA etc. The analysis of country/region wise distribution of patents related to nano-based curcumin shows that the maximum number of patents (129) has been filed from the USA, followed by China (36), India (23), Europe (19), South Korea (15) and others. As far as the publication activity is concerned (an inset given in Fig. 8 shows countrywise scientific publications) again USA tops the list with 67 publications to its credit followed by India (52), China (28), South Korea (9), UK (8), Japan (7) and others. We have also listed the highly cited papers based on average citations per year in the area of nano-based curcumin as given below. The major area of research is focussed on enhancing the bioavailability of curcumin in the highly cited papers. Curcumin is an active ingredient of the spice turmeric and has recently emerged as a powerful anti-oxidant, anti-inflammatory and anti-cancer agent having great potential to prevent and treat chronic and life threatening diseases. However, its therapeutic potential has not been fully exploited due to its poor bioavailability. Nanotechnology-based drug delivery systems provide a unique solution to overcome this problem of low systemic bioavailability of curcumin. The literature and patent analyses clearly reveal the emerging importance of this unique multi-functional chemopreventive agent. The analysis also suggests that efforts are being directed towards assessing its potential to prevent or treat deadly diseases such as cancer, cardiovascular disorders, neurological disorders, inflammatory diseases etc. Extensive R&D and patenting activities are being pursued worldwide, especially in USA, India, China, Europe and South Korea. It is also quite evident that only R&D institutes, universities and a few small bio and pharma companies are involved in publishing and patenting activities. The patent analysis further reveals that in nano drug delivery approaches, polymer nanoparticles (generic polymers, liposomal, PEG, micelle, PLGA) play a dominant role followed by curcumin nanoemulsion, nanosuspension , phospholipids complex , cyclodextrin curcumin self assembly, hydrogel NPs and SLNs in decreasing order. It is hoped that these efforts on a global scale would eventually usher in a new era of affordable, safe and effective drugs for the benefit of mankind.